Ian is proud to have developed a two-year curriculum, essentially a “mini-MBA” for Garden Retailers. More than 200 of the leading business owners and managers of retail operations throughout the US and Canada have graduated from this innovative program. New classes enroll every two years. Get more information on the full GCU Curriculum. Trainees learn to convert the Features and Benefits of their products into “Ka-Chings”, or impulsive, emotional buying motives. Increases the customer’s Average Spend through the sales associates understanding the consumer’s needs and aspirations. TLC’s virtual format (on DVDs and downloadable workbooks) enables retailers to personalize and run the program annually or seasonally as new associates come on the team. 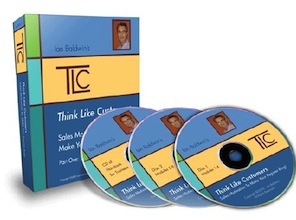 To purchase your own TLC Training program for $895 + S&H, download and fill out the order form. Ian's role as a consultant to the garden industry is exemplary. He combines solid business skills with convincing communication to his clients. He keeps his passion for the industry in check with a realistic understanding of real business. He communicates the key result which is bottom-line success in a manner that reaches his clients." Thank you for the solid tactical and strategic takeaways!" Before You Spend It All at the Next Trade Show….